Today's prehistoric animal of the week was requested by a fan through our comments section. Let's check out Mussaurus patagonicus! Mussaurus was a plant-eating dinosaur that lived in what is now Argentina during the Late Triassic Period, 215 million years ago. Its name translates to "Mouse Lizard/Reptile" because the first skeletons found of of this dinosaur were only about eight inches long. Mussaurus patagonicus baby investigating a stonefly as it gets sniffed by mom. Reconstruction by Christopher DiPiazza. You might be thinking "Wow! 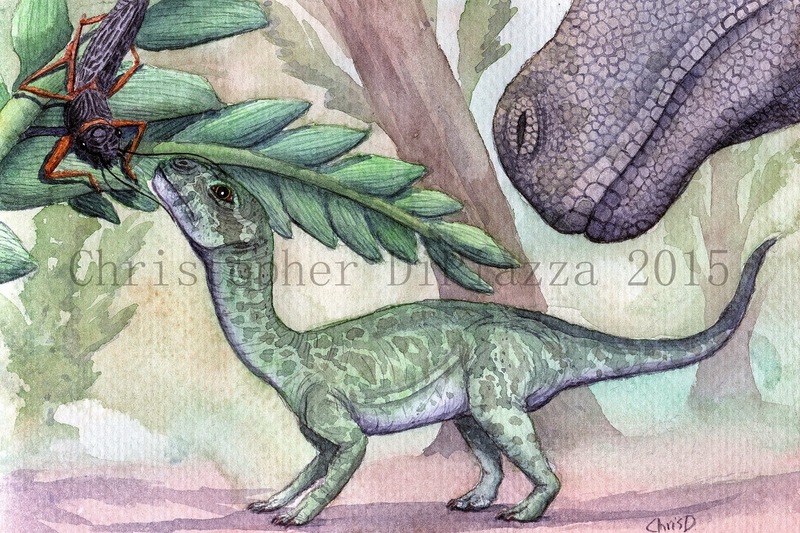 Mussaurus was probably the smallest non-avian dinosaur ever discovered!" and for a while that is what a lot of people believed, even though many paleontologists believed that these skeletons were most likely from babies and could have grown to be much larger. In fact, the original Mussaurus skeletons were actually found near nests with eggshells, further supporting the hypothesis that they were only babies. It wasn't until 2013 that a research paper was published, describing some bones found from the same area as the tiny skeletons that were concluded to be from adult Mussaurus, which were indeed, much larger. Judging by the bones that were discovered, which included limbs, hips and a tail, these adults would have measured roughly ten feet long from snout to tail. 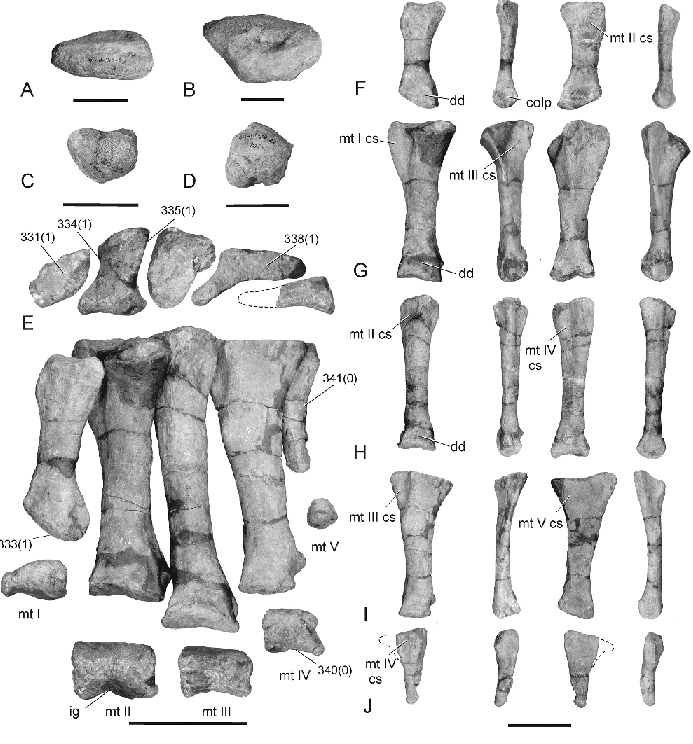 Photograph of the bones from an adult Mussasaurus' left foot from the 2013 paper in the Journal of Vertebrate Paleontology. Baby Mussaurus had proportionally huge heads with large eye sockets and short snouts. This is a common trait for the babies of vertebrate animals, especially those that exhibit parental care. A large head with large eyes traditionally make an animal appear cute to its parents. That way the parents will more likely want to care for the baby and would be less likely to abandon it...or eat it, especially when it is being a pain in the tush. I'm serious. There is a very good reason why baby animals (including human kids) are cutest at the neediest parts of their lives. This cute appearance has even been selectively bred into domestic dog and cat breeds to persist through adulthood. My Yorkshire Terrier is a senior at thirteen years old and still looks pretty much the same as when he was a puppy. It's not because he is small. It's because he has a proportionally big noggin and big eyes. Ever wonder why small dog breeds are more commonly spoiled by their owners than large breeds? It's because they look like babies and their owners treat them as such. So what kind of dinosaur was Mussaurus? How do we know the fragmentary remains from the adult specimens go with the strangely-proportioned small specimens? The answer becomes clear when we search the fossil record and find other examples of more completely known parent and baby dinosaur discoveries. Last year I reviewed a dinosaur called Massospondylus. Massospondylus is known from nesting sites that include adults with nests of babies and eggs. The baby Massospondylus look very similar to baby Mussaurus in heir proportions and they both even walked on all fours. The adult Massospondylus, however had much longer necks, proportionally small heads, and walked on their hind legs. The specimens that were determined to be adult Mussaurus show the same features. Mussaurus was a kind of prosauropod dinosaur, like Massospondylus. The more famous, Plateosaurus, was also an example of a prosauropod. Prosauropods were generally plant-eating dinosaurs that were most common during the Triassic and the beginning of the Jurassic Periods. Paleontologists believe that some prosauropods were the ancestors of the later, gigantic sauropods, like Apatosaurus. 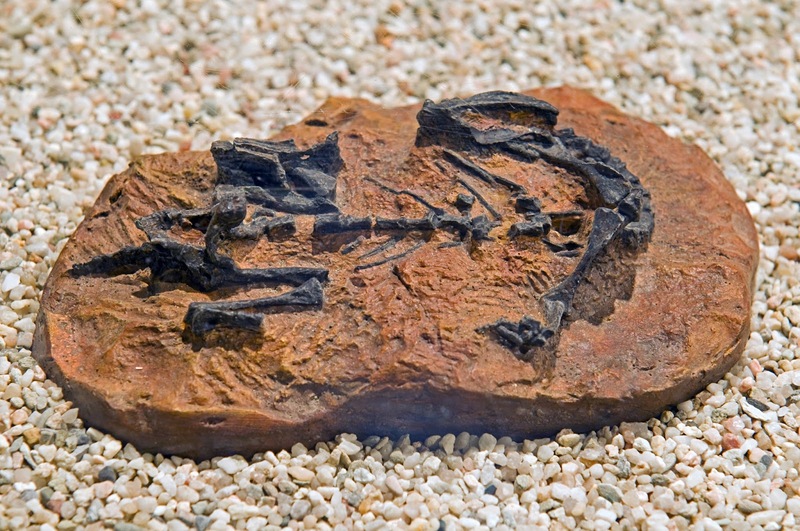 Skeleton of a baby Mussaurus. Mussaurus." In: Dodson, Peter & Britt, Brooks & Carpenter, Kenneth & Forster, Catherine A. & Gillette, David D. & Norell, Mark A. & Olshevsky, George & Parrish, J. Michael & Weishampel, David B. The Age of Dinosaurs. Publications International, LTD. p. 40.